EZLynx believes that agencies spend too much time and money trying to manage commissions. Defining commission rules and producer payouts is an important part of any well running shop; however, it is a cost center for the business. Between setting up complex rules, reviewing and importing statements each month, correcting data, and verifying payouts, agencies are spending a tremendous amount of employee time and money on non-revenue generating activities. We decided to reduce the complexity and remove the guess work from the commission process. Keeping with our product roadmap to focus on four key pillars of improving productivity, serviceability, scalability, and profitability in agencies, EZLynx Commissions simplifies a complex process so that any agency can accurately track and pay commissions. We are currently under way on the complete overhaul of this workflow to help agencies increase productivity and reduce their efforts on this tedious process. Commissions are the lifeline of an insurance agency. Each step of recording, reconciling, reporting, and managing commissions directly ties to someone’s paycheck. We are implementing our enhancements to this process in steps as we push toward our goal of a smarter, simpler commissions system. At each stage, members of our beta program will provide month-over-month feedback to ensure the tool meets the unique needs of independent agents. Every new month creates a costly and time-consuming challenge for your agency. Each carrier sends their statements in slightly different formats. Remembering the variations and updating these large data sets prior to bringing them into the system is a costly learning curve each month. This adds to the frustration and costs the agency valuable time and resources. We simplified the number of steps needed when importing in order to improve your workflow and increase your agency’s efficiency. Minor differences from the carrier can be time consuming to fix every week, so our new statement import feature remembers this information for your agency – so you don’t have to. As imports arrive and you make changes to the information, EZLynx will remember your import mapping and data corrections. For example, if the carrier sends the full state name instead of state abbreviation, after you correct it one time, EZLynx will remember it for every subsequent upload. Most people don’t think about commissions until there is a problem. When producers don’t get paid out at the correct rate or the agency over pays, it is obvious that there is a problem. Commission rules power the payout system and align to the agencies payout structure. Any issue in setting up the rules or ordering is apparent once the statements come in. EZLynx Commissions empowers agencies with a streamlined creation workflow and an intuitive rule engine to simplify payouts. The step-by-step workflow guides you through the creation of each rule, adding criteria, and defining payouts in a simple, easy to understand format. Based on feedback, we have included several additional options such as department and policy effective dates. Commission management is a vital component of every agency. With our latest updates, EZLynx wants to bring efficiencies to save agencies time and increase productivity in their back-office processes with a streamlined commission system that is simple and accurate. The new rule creation workflow is currently in beta, and we are looking for agencies to provide month-over-month feedback on the new features. Agencies get a side-by-side comparison of the new rules and their existing rules to review and ensure complete accuracy before the full release of this feature. If you are interested in participating, you can apply to join the Beta Team by clicking HERE. As technology becomes increasingly important for conducting business, it is no surprise that the insurance industry has become more digital. Still, according to a recent Forbes article, only 15 percent of insureds report being satisfied with their insurer’s digital experience, leaving agents with the opportunity to easily set themselves apart from the competition by providing a more positive technology experience. Recognizing these business trends, EZLynx provides for your needs as an agent as well as your client’s requests. By working as an online portal for customers to make secure requests and view other important documents, EZLynx Client Center works as a 24/7/365 digital customer service representative, putting your agency in the position to exceed customer expectations. EZLynx Client Center gives your clients the control and the digital communications capabilities they want from their insurance agent. With Client Center, your insureds can access their policy, submit change requests, and view their ID cards from anywhere, even the side of the road. As an agent, share confidential documents for your customers to print without security concerns. Client Center will also save you and your commercial clients valuable time. Using templates set up by administrators in your agency, insureds are able to add interest holders and self-generate Certificates of Insurance without changing any other policy information. Through the power of ONE PLATFORM, you will receive a notification of the new certificate holder by email and in EZLynx Management System, and your insureds will receive the documentation they need, when they need it. 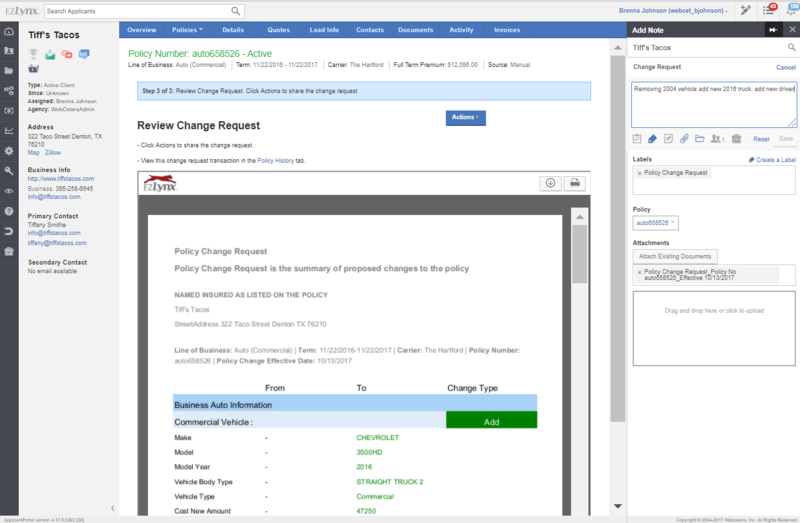 Additionally, your insureds can request policy changes, update contact information and view policies through Client Center. You will receive a notification of all change requests in EZLynx, allowing you to service your accounts, faster. All of the actions in Client Center will be logged automatically in EZLynx Management System. This seamless digital platform will reduce your E&O exposure and allow your agents to quickly understand a request or question when a client directly contacts the office, allowing your agency to provide an improved omnichannel customer service experience. A new enhancement to EZLynx Client Center will allow your agency to provide a preview of your digital capabilities during the sales process by allowing you to share secure documents and communications with prospects. Client Center does not replace all of your interactions with your clients, rather, it makes your interactions more efficient. As an agent, you will be able to focus your attention on being hands on with your customers when needed or giving customers the ability to self-service their accounts when possible. 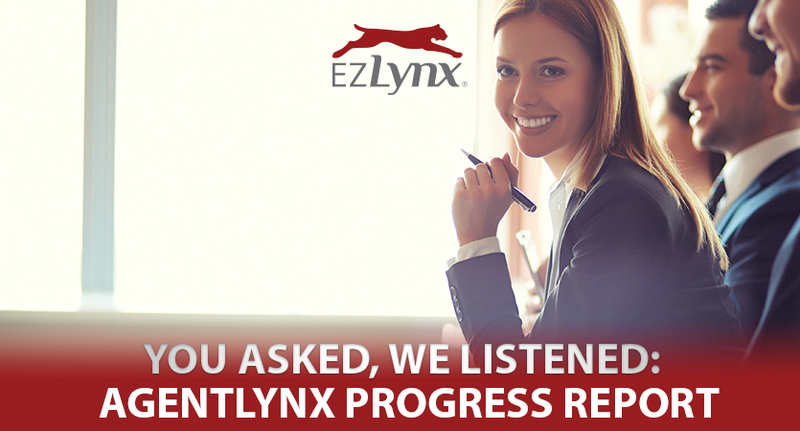 With EZLynx Client Center, make a lasting first impression, improve customer service, and exceed expectations. MissionSelect Expands Partnership with EZLynx to Process Property Insurance Quotes for Texas Independent Agents. Flower Mound, Texas, June 27th, 2018 — MissionSelect now offers the ability to receive a quote for their “Premier” residential property insurance product through the EZLynx platform. MissionSelect offers specially-crafted insurance products for an independent agent’s valued customers. With MissionSelect’s numerous and generous discounts, agents can offer their customers the coverage they need at a price they can afford. The two most common products offered at MissionSelect are their Classic Product (a traditional HO-A product) and their Premier Product (an HO-A Plus product). 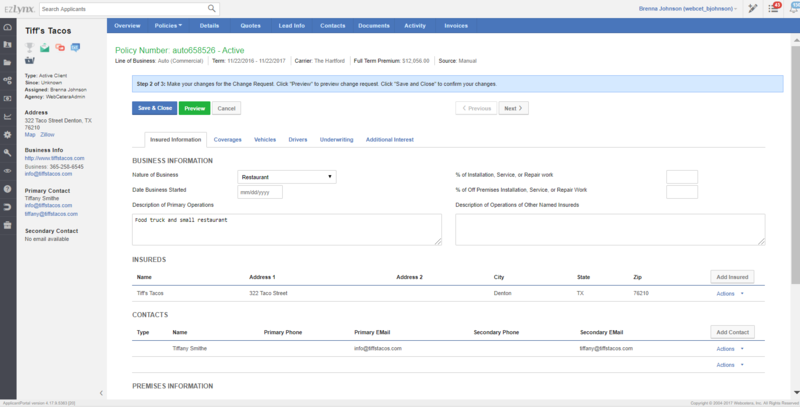 Thanks to EZLynx, independent agents receive a custom quote for MissionSelect’s Premier Product with coverages and limits selected by their customer. These quotes are then stored in the MissionSelect processing system under the “Applications” tab for convenient retrieval and quote management. “To ensure agents have the best coverage options available, EZLynx is focused on adding key, state-specific carriers to our rating platform across the country. We are proud to have MissionSelect as a carrier to represent and provide great service to agents in the great state of Texas,” said Kevin Coplin, Director of Carrier Relations at EZLynx. Improvements like this are part of MissionSelect’s ongoing initiative to continuously improve their product and service offerings. Recently, MissionSelect launched their newly redesigned website which focused on improved usability, a fluid mobile-responsive design, and look and feel that more appropriately reflects the MissionSelect brand and company culture. MissionSelect provides exceptional property insurance solutions for Texas independent agents. As a Texas-based managing general agency, MissionSelect is 100% committed to the success of professional independent agents in the Texas residential property market. No credit scoring is required, and great rates are available for first-time buyers. Everyone has a story of a bad customer service experience that shaped his or her perception of a company; however, most of the day to day interactions are mundane. When a company comes along that truly provides an exceptional service, it stands out in the sea of mediocre experiences and often creates a life-long bond with the customer. EZLynx believes it can leverage technology to help its agencies gain efficiency in service to provide an extraordinary experience every time. For several years, we’ve focused on developing solutions that increase an agency’s profitability, productivity, serviceability, and scalability. We believe that several current and upcoming features will help agencies achieve significant gains in the time it takes to provide an exceptional service experience for the customer! This is your one-stop shop in EZLynx for seamless multi-tasking and collaboration. Agency Workspace is the primary area for keeping track of tasks, notes, notifications, reminders, and text messages in one area. This directly contributes to an agent’s ability to provide prompt, efficient customer service. 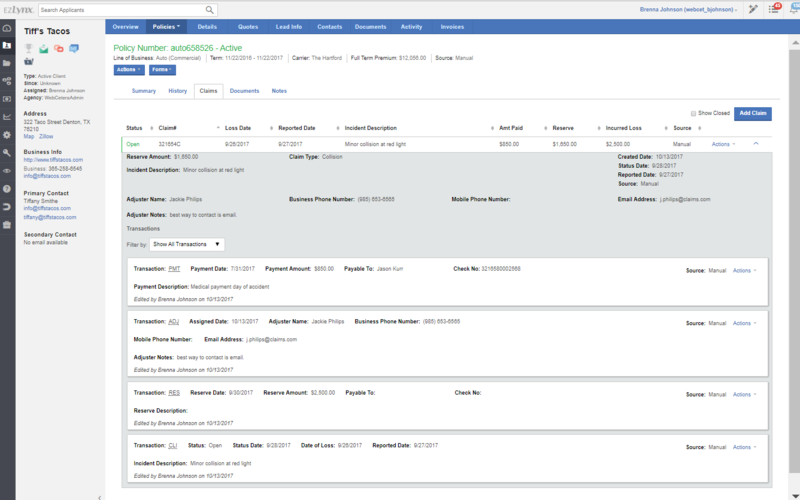 Quickly access the context for customer related tasks and notes, track your latest tasks, and immediately see important notifications. Other systems simply list activities in reverse chronological order, so agents spend hours pouring through all these activities to piece together the context of a note or activity (other systems call it a diary). EZLynx has several methods to pull in the context and organize this for the agencies, saving agent’s time and frustration. It’s a no-brainer that giving your customers a way to access policy details and documents on their own will save them (and you) from an extra phone call or email. Client Center makes this possible, and it can be seamlessly integrated into your website. Clients can submit change requests and other inquiries directly from Client Center as well. These requests, rather than getting buried in your email inbox, drop directly into EZLynx. Agents will be assigned a Task with all the relevant details that they can easily track from within their Agency Workspace. Change requests and endorsements are time consuming for agencies. One of your agents must document the need from the customer, make a change on the carrier’s website, and keep the data in sync with the management system. In 30 days, one of your agents must remember to verify that the carrier processed the change correctly. This process is time consuming and fraught with human error. To streamline this process, we have introduced a change request workflow to simplify the documentation, confirmation and tracking for an agency. Simply make the policy changes directly in EZLynx. The green preview allows you to quickly verify the changes while you are entering them. When you save, EZLynx generates a memo of the requested changes that you can send to the carrier, share with the insured, or include in an eSignature. For carriers that require it, one action will generate the ACORD change request forms. The memo clearly identifies additions, deletions, and changes in a way that even the insured can easily understand. With one click, we will pre-fill the note with the description of the change and attach a copy for follow up. Agents can easily complete this process and share it with the insured to review by the time the call ends. Once the carrier processes the change, we automatically verify the downloaded change is accurate and confirm it. If the policy is manually entered, your agent can confirm that everything is correct with a simple click. Part of creating an exceptional customer experience relies on an omnichannel communication platform. Every customer has different communication preferences, so agents can deliver the memo via the customer portal, email, mail, or even documented text message. Since EZLynx is a single platform, all of the customer correspondence is readily available on the customer’s account so that any agent can provide continuity during service in any channel. The first claim is a defining point in the insured’s relationship with their agent and is an excellent opportunity to provide exceptional service to your client. Insured’s frequently rely on the agent to guide them through the process, answer questions, and manage expectations. Customers expect their agent to have the latest information from the carrier. To keep agents up to date on the claims information from the carrier, EZLynx offers downloaded and manual claim support. We summarize the latest information from the carrier on the client’s account so customer service representatives can quickly answer questions on claim number, adjuster information, payments, and the claim status. On each policy, we provide a detailed view of all of the claims transactions. Providing your customers with exceptional customer service every time is no simple task. While it is an important part of the value you offer as an independent agent, we know it can be tedious and time consuming to keep up with all the data and different communication channels. Agents can easily miss something when bouncing back and forth in multiple systems. Leveraging our single platform and technology to your advantage frees up your agents to focus on the customer experience. We’re focused on building out new features and enhancements to improve an agencies profitability, productivity, serviceability, and scalability. These latest features help simplify the service documentation in your agency, so you can spend time on what really matters – your customers. If you are interested in learning more about how EZLynx can help you save time and increase productivity with your customer service, please let us know below. 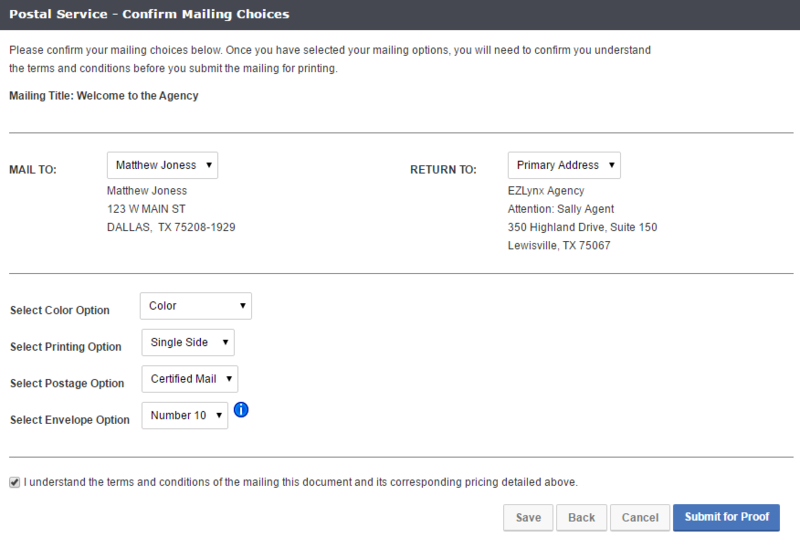 With EZLynx Postal Mail, you can select any PDF or ACORD form from your applicant’s document library in EZLynx and have those documents printed and mailed to the applicant in only a few simple clicks. Simply select (or upload) your documents, verify the mailing and return address, choose your printing options (#10 Envelope, Flat Envelope, Black and White or Color Printing), choose your postage type (First Class or Certified Mail), and we’ll take care of the rest! Like our Bulk Campaigns feature, you only pay for what you use. Rates are determined by the number of pages, printing options, and the postage type. While this first version will be limited to sending single mailings to individual applicants, we are excited to start getting your feedback as we explore opportunities for bulk mailings and other mailing types like folded cards, post cards, and more. Focus on your customer relationships – don’t waste time stuffing envelopes. Save money and get closer to becoming a paperless office – no more printers, paper, envelopes, and stamps. Save a trip to the post office for those certified letters! You’ll be able to send official certified letters with EZLynx Postal Mail and receive digital confirmation of signature and delivery from within EZLynx. Better record keeping for E&O – all of your mailings are logged and saved forever. Even regular first class letters can be tracked to their final post office destination prior to delivery. If you are interested in adding this feature to your account, let us know by filling out the form below or reaching out directly to your sales rep.